With the rapid progress in disease research and increasing demand of studying molecular dynamics for drug development, high-throughput and ultra-sensitive biosensing platform at single molecule level is an integral tool for biomedicine and drug discovery. Current methods to study molecular interactions require labeling the subject molecules with fluorescent reporters. The effect of the fluorescent reporters on molecular dynamics, however, has not been quantified due to lack of alternative methods. We develop a hybrid photonic-plasmonic antenna-in-a-nanocavity system that allows us to study molecular interactions at single molecule level, in real-time, without labels. Using this new tool, we characterized the effect of traditional labeling methods (e.g. FITC, GFP) to molecular interactions and discovered that molecular dynamics might be significantly perturbed by the fluorescent labels. Amyloid plaques and neurofibrillary tangles are the pathological hallmarks of Alzheimer’s disease. However, there has been a long-standing discussion on the dynamic relations between Aβ and tau proteins, partially due to the lack of a tool to track protein dynamics in individual live neurons at the early stage of Aβ generation and tau phosphorylation. 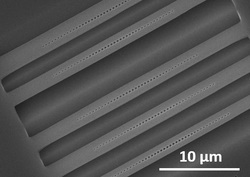 We develop a nanoplasmonic fiber tip probe (nFTP) that allows us to measure the protein expressions and their post-translational modifications in single living cells, thus providing an advanced method to determine the outcomes of intervention of Alzheimer's disease and other neurodegenerative disorders. Perovskites are emerging as potential next-generation materials for optical and optoelectronic applications. However, their inferior stability in polar solvents and humid environment, as well as their rapid degradation via photothermal and photochemical processes, has placed a grand challenge in their way to many other applications. We develop a new core-shell perovskite nanocrystal with significantly improved stability. Our bottom-up strategy demonstrates the possibility to engineer perovskite materials using ligand chemistry at the molecular level to improve and modify their current properties. ​Alzheimer’s disease is a devastating neurodegenerative disorder and the primary cause of dementia in the elderly, with no effective therapeutics presently available. Considerable evidence shows critical roles of intracellular pathogenic events of Alzheimer's disease. However, we have a large knowledge gap from intracellular, early-stage neurological processes to the onset of neurodisorders. Neither do we have effective ways to interfere with early-stage neuropathogenesis. 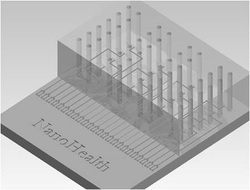 ​The lab-on-a-chip single molecule nanosensor and lab-on-a-tip single cell nanoprobe provide unique ways to investigate Aβ oligomerization and aggregation fundamentally at the single molecule level, as well as in living cells to determine the outcomes of interventions of neurodegenerative diseases.